When I signed up for The Nutrition School (now known as The Nutritious Life Studio) last Spring, I had no idea what to expect. I had seen some of my Instagram friends post about it and thought it looked like a good way to further my education. I had, of course, heard of Keri Glassman, but didn’t know a lot about her either. Taking the twelve-week course and the follow-up Masterclass turned out to be one of the best decisions I’ve made in my career. I have met so many wonderful people through the program, most of all Keri and her amazing team at Nutritious Life! I am so excited to feature Keri on LivLight. She is not only one of the best in the biz, but is also kind, super smart, and successful in all she does. She is a truly dynamic person, beyond supportive, and absolutely beautiful inside and out. Hope you’ll read on to learn more about Keri Glassman and Nutritious Life, and be sure to check her out on Instagram @nutritiouslifeofficial and on her website www.nutritiouslife.com! My alarm goes off at…I usually don’t make it to the alarm going off at 5:30 because I’m already awake but that is when it technically goes off. I love and crave my morning time. My whole day is thrown when I don’t have the proper space to start the day. I have always been this way – even in college I was an early riser. The first thing I do is…coffee, meditate (sometimes better than others), cross one thing off my to-do list for the day. Then, make lunches, breakfast and everything else that goes along with mom’ing it in the morning. My favorite products are…oils and scrubs! Right now Indie Lee (oil) and Herbivore (scrub). My uniform is…jeans, sneakers and a t-shirt (or ribbed turtleneck in winter.) I’d love to never be more dressed up than that! My go-to workout is…outside run or a HIIT class. But my fave is a good hike, snowboarding and paddle boarding. My favorite activewear is…Koral, Sweaty Betty, Michi and since forever…Nike. Lunch is…greens, lean protein and fat, usually at my desk. Snack is…mixed nuts or avocado with lemon, sea salt and cayenne. I drink…coffee (with almond milk and no sweetener), water (bubbly and flat with lemon) and loads and loads of tea (green and herbal)!! My favorite dinner is…grilled salmon, some kind of roasted greens and sweet potato – for keeping it simple, clean and easy. Or, almost any kind of ethnic food! I am sleeping by…fingers crossed… 10:30 after I…drink chamomile tea and kiss my kids. Do you have a personal eating philosophy when it comes to health and wellness and what do you recommend to others? I truly live and breath by the Nutritious Life philosophy – this means that it’s not all about the food. The other pillars of a Nutritious Life play an equally important role in optimizing our health and wellness. So focusing on what I’m drinking, how I’m sleeping (usually not so great, I need to work on this one!) etc. is of the same importance as what I eat for breakfast. And, when it does come to the food, I focus on eating consistently throughout the day, the most nutrient dense foods available in proper proportions while listening to my body. A dreamy lunch to me could be dark greens topped with a variety of roasted veggies, topped with sunflower seeds and drizzled with olive oil and dried or fresh herbs with a vegetarian chili on the side (it’s cold today so I’ve hearty winter foods on the mind!). I’ve been recommending this to people for the past 17 years since I opened my practice and even with experimenting with new trends and incorporating foods that weren’t as readily available (chia and maca weren’t things in every store 15 years ago) this overarching philosophy still works and can work for all kinds of lifestyles and diets. What role do you think exercise plays, especially for those looking to lose weight? This is a quote from me straight from my website on my thoughts on exercise: Consistency is key when it comes to working out. It’s not how often, but how consistent you are and how much you are progressing. Workout for an exercise goal – lift more weight, run faster, perfect that yoga pose – it is more mentally and physically rewarding than lacing up sneakers to lose weight. Also, exercise is a pillar of a Nutritious Life because all of the components work together – when you eat well, you workout well, you sleep well, you love well, you workout well again…it all connects. All the pillars support and enhance one another. Can you tell us a little bit about Nutritious Life and The Nutrition School? When I started my private practice 15 years ago, I never wanted it to be all about diet. Nutritious Life has always extended far beyond food and diet to sleep, stress, exercise, relationships etc. Nutritious Life is a lifestyle and media company devoted to helping individuals discover and live their most nutritious lives. We steer people towards wellness strategies that work for them, via accessible, science-backed healthy living advice made to inspire conversations over crudites, cocktails or cardio. We make research relatable and the aspirational actionable. The Nutrition School (now known as The Nutritious Life Studio) is our education platform. Currently, it includes a 12-week, go-at-your-own-pace online certification course in health and wellness where individuals gain real and relevant skills in nutrition principles, counseling techniques, and marketing strategies. My favorite part of this platform is the incredible community. The women (and men too!) in this group support and empower one another in such a huge way that I get all kinds of girl power/girl boss feels when I see it. It is seriously beautiful and extraordinary to watch. 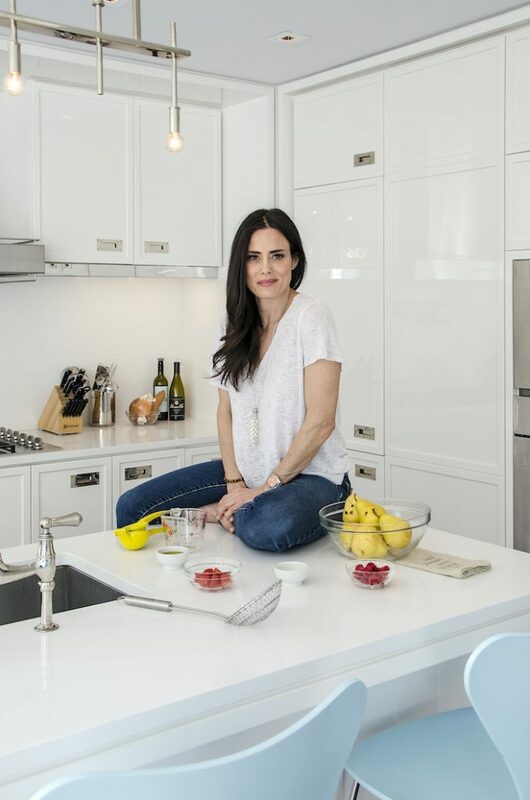 How did you decide to take the leap and leave private practice to start The Nutrition School? This was something that was always on the bucket list/goal list/dream list (whatever you want to call it). When I started my practice I had this vision of taking it nationwide (side note: we are in 16 countries!) to help me in my mission of reaching as many people as possible to help them raise their nutrition a notch (that’s still the mission!.) I just didn’t know how I’d do it. I came to a place in my career where I had done many things but hadn’t touched on this. I started talking to people and learning how and what to do…then I just did it. I set up a timetable to launch, followed that plan and took the leap. I think you have to put yourself out there, you have to go for things, you have to push yourself knowing that what’s the worst that happens, you fail? So, what. You learn from that and move forward. Building The Nutritious Life Studio – we have more products coming soon! Do you have a favorite recipe you would share with LivLight readers? There’s something about this Nut+Seed bread that I’m so obsessed with this season!